If it cannot be remedied? We start this season of Bodhisattva Deeds (Term 2) with the chapter on Patience, which is the opposite of anger and the antidote to anger. Here we learn how to deal with difficult people, difficult situations, and difficulties with our Dharma practice. Later this summer, we learn how to develop Joyous Effort, i.e., enthusiasm for doing good deeds and for pursuing our Dharma practice. And we will get started on (but probably not finish) Chapter 8, Meditation, beginning with getting rid of obstacles to meditation. We are using the Stephen Batchelor translation A Guide to the Bodhisattva’s Way of Life, of the root text by Shantideva, Bodhicaryátara. A digital copy of the text will be available to registered students. Materials needed will be provided to registered students through a webpage from which files can be downloaded. Note: These dates have changed slightly due to Ven. Steve touring schedule. There are expected to be approximately 39 sessions required to complete Engaging in the Bodhisattva Deeds, one of 12 subjects in the Basic Program. So, this topic will continue into at least one more term. This is an intermediate level course. We started the book last year, but each chapter is a new topic. You are very welcome to jump in at this point. The Basic Program is a multi-year, twelve-subject course of studies designed by Lama Zopa Rinpoche. It provides a practice-oriented transmission of the Buddhadharma to committed students ready to progress beyond foundational-level study and practice. Its comprehensive curriculum greatly enhances students’ Dharma understanding, establishing a sound basis for ongoing study, practice, retreat and service. FPMT centers worldwide offer the program at a variety of levels; it is also available for homestudy as an Online program. Some of Tibetan Buddhism’s most treasured texts form the heart of the Basic Program. Je Tsongkhapa’s Middle Length Lam-Rim, Shantideva’s Bodhisattvacharyavatara, the Heart Sutra, Jetsun Chökyi Gyältsen’s Tenets, Maitreya’s Ornament for Clear Realization and Tathagata Essence,the Wheel of Sharp Weapons and others guide the practitioner through a comprehensive study of sutra and tantra. 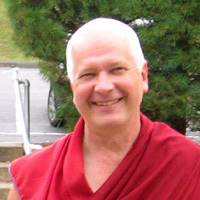 Venerable Steve Carlier (Thubten Sherab) was born in the UK, and has been studying Buddhism since 1977. He first met Lama Yeshe, the founder of the FPMT, and Lama Zopa, its current head, in 1978. He was ordained as a Buddhist monk by Lama Zopa in 1979 and received full ordination from Serkong Tsenshab Rinpoche the following year. He studied for eleven years at Nalanda Monastery in France, and from 1993 to 2004 was one of only a handful of Westerners who have followed the Nalanda (India) tradition of studies at Sera Monastery in India. Since 1978 he has been a student of the revered abbot emeritus of Sera Je monastery, Geshe Jampa Tegchog. More recently he has served as this great master’s interpreter. He is currently at Land of Medicine Buddha, teaching the Basic Program.